Do you have a jewelry collection full of pieces you would love to wear and pair with a great outfit? But, the problem is, your jewelry is scattered, or worse-piled all up on itself in a shallow drawer so that you can barely discern a pair of great earrings from a tangled necklace? 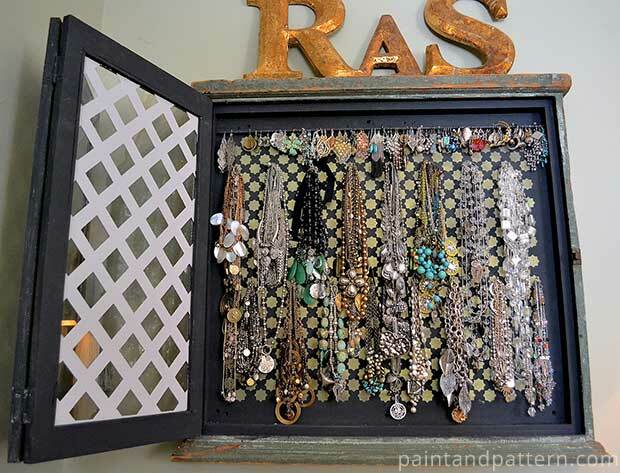 Well, here’s one solution: make your own upcycled jewelry display cabinet from a thrifted or antique store undiscovered treasure. Your jewelry collection deserves a good home, and YOU deserve a jewelry solution as interesting as you are! During my travels around Europe, Morocco and East Africa, I loved to discover and bargain for jewelry pieces crafted by local artisans to add to my collection. Jewelry is easy to bring home, fun to wear and often inexpensive. After several trips, though, storing my treasures in little fabric bags and odd shaped boxes got out of hand and a storage solution was in order. Recently during a visit to a favorite antique shop, an old wooden school message center spoke to me in all of its filthy glory. It featured crackling green paint, severely distressed areas with no paint at all, and glass that was intact but showed no promise of getting clean again. It was the perfect candidate for an upcycled jewelry display cabinet. Thus began a project that grew over time. After deciding not to repaint the exterior, the inside got a new coat of Graphite Chalk Paint® decorative paint by Annie Sloan. When dry, my husband drilled two holes near the inside top, inserted a dowel and glued it for stability. Instant earring holder! 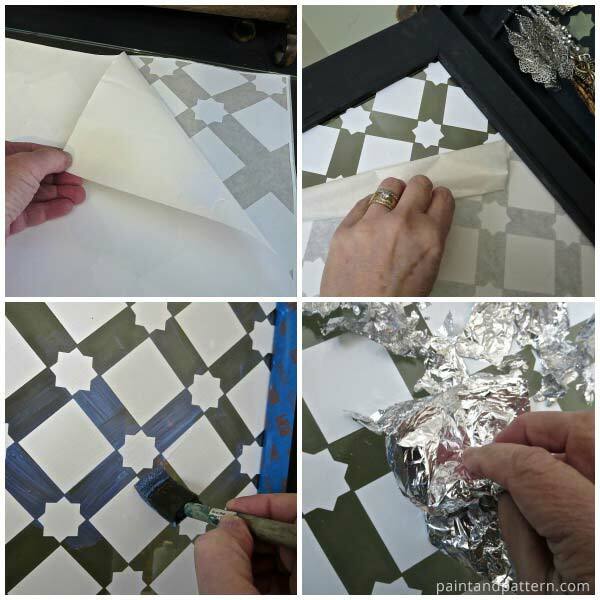 Next, I stenciled the small-scale Royal Design Studio Eight-Pointed Moroccan Star pattern in Patina Green Royal Stencil Creme to make a pattern in which I could screw cup hooks to hold the necklaces. 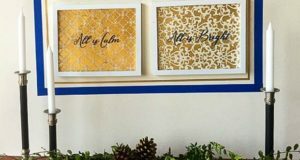 Modellos® Designs decorative masking patterns, or one-time use custom stencils, are the perfect solution to working on glass. I wanted to add gold and silver Metal Leaf details with a coordinating Star Diamonds Moroccan pattern. I wanted a design where part of the glass would remain open so that the jewelry was partially visible even with the doors closed. To place my custom order, I supplied measurements for the two pieces of glass, the design I want, and my “negative weed” specification to the Custom Design department at Modello Designs. Star Diamonds Moroccan Stencil ordered as a negative weed Modello® pattern. STEP 2: Once the Modello® stencil is secure on the glass, use the white plastic burnishing tool that arrives with your pattern to further secure it and remove the the Transfer Tape paper. 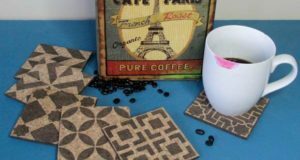 Find out more about how to use Modello® stencils here. STEP 3: Use a foam brush or stencil brush to brush or stipple on Clear Royal Stencil Size in the exposed areas of the pattern. Find out more about how to use Royal Stencil Size here. Allow the wet size to get “tacky”, approximately 15-20 minutes. STEP 4: Remove individual sheets of Imitation Silver Leaf from the book and crumple them slightly as you apply the leaf to the sized areas. Burnish the leaf onto the surface by rubbing over it with a soft cloth, lambswool pad, or even a piece of crumpled wax paper. Add more leaf as needed and repeat until the area is complete. STEP 5: Use a pick tool or similar to remove the vinyl star shapes, exposing the clear glass in just those areas. STEP 6: Paint some additional Clear Royal Stencil Size in the star areas only. It is OK if the size overlaps outside of the star shape. This is a “reverse gilded glass” technique so you will only see the gold leaf that comes next from the front side of the cabinet door glass. Again, allow the size to get tacky before continuing on to the next step. 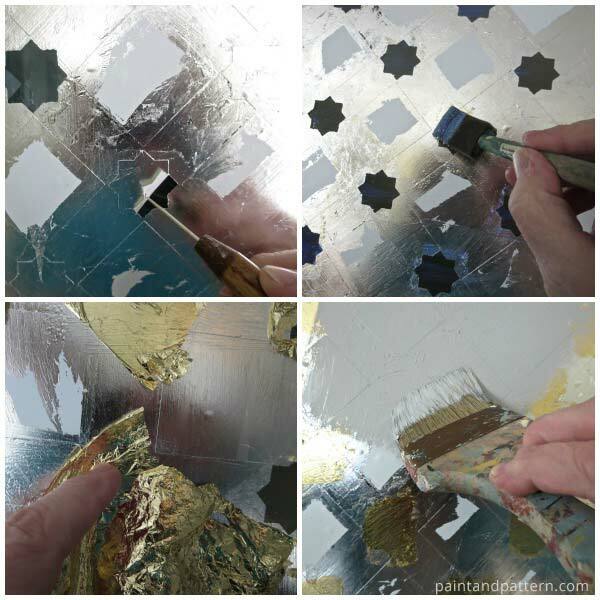 STEP 7: Apply Gold Metal Leaf to the sized areas using the same technique as outlined in Step 4 above. Burnish all the leaf again well. Allow all to dry overnight. STEP 8: Seal and protect the leafed pattern by brushing over all with Chalk Paint® or other another paint. I used Paris Gray here, but alternatively could have used Graphite Chalk Paint® as I did on the back of the cabinet. After the paint has dried well, remove the remaining areas of vinyl. You can see from the detail that the gold and silver leafed Moroccan stencil pattern looks WAY different from the front than from the back. 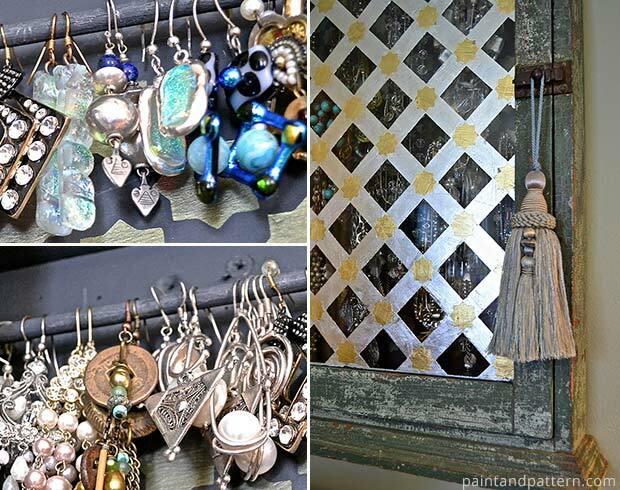 Because the metal leaf is now behind the glass, and also protected with paint on the backside of the glass, I don’t have to worry about wear and tear and should be enjoying this upcycled jewelry cabinet for many more years. 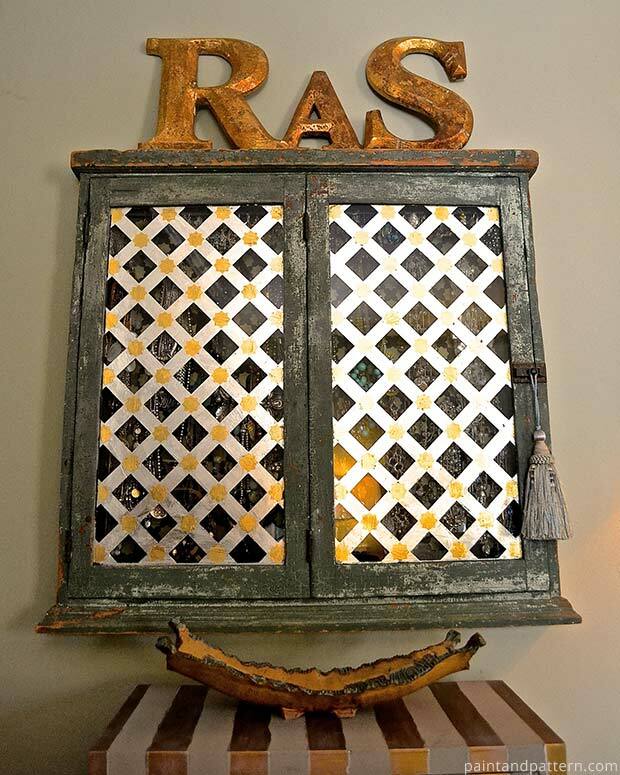 You may never find an old message board just like mine, but these ideas can easily be tailored to your own cool finds. We’d enjoy hearing from you, so send us photos of your upcycled creations. 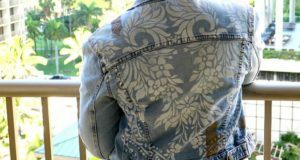 You never know when your pattern magic may show up on Paint + Pattern! 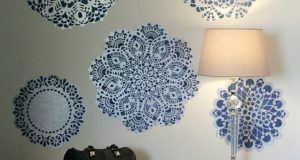 Check out more Off The Wall paint and stencil ideas here! Debbie, this is glorious! Like that’s even more than gorgeous. The really chippy paint, love that too. I didn’t realize the eight point star stencil could be so small, nice to see what it can do. Hey Deb, this was really fun. Sometimes a project that grows over time is more special. Not to mention I wear more than the same old jewelry pieces now because I can see it all! cheap Broncos jerseys. Sale only 18$ And 100% Stitched free shipping. wholesale cheap Bulls jerseys. 90% Off and 100% Stitched. Sure, shingles could be applied over an existing roof.